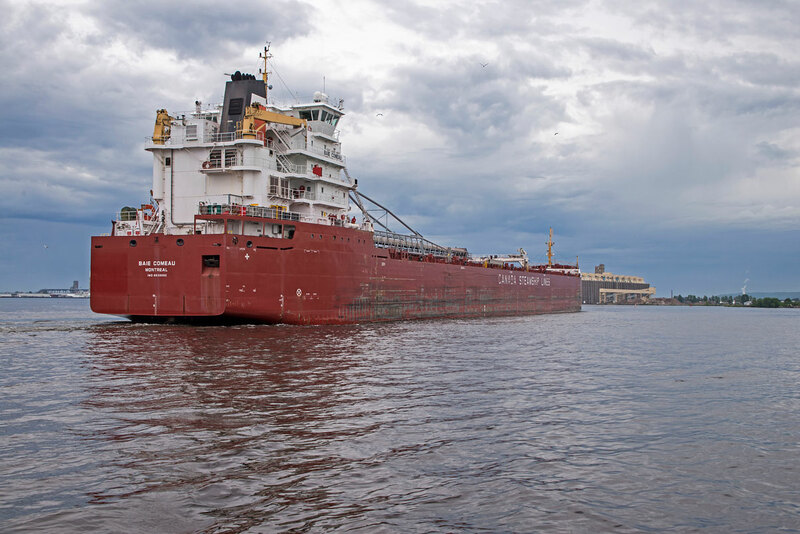 My wife and I frequently walk down to Canal Park in Duluth, Minnesota to watch the ships arrive. On this night we were able to catch two ships as they arrived about an hour apart. The first to arrive was the Baie Comeau flying the Canadian Flag. Between ships we walked out to the North Breakwater Light. 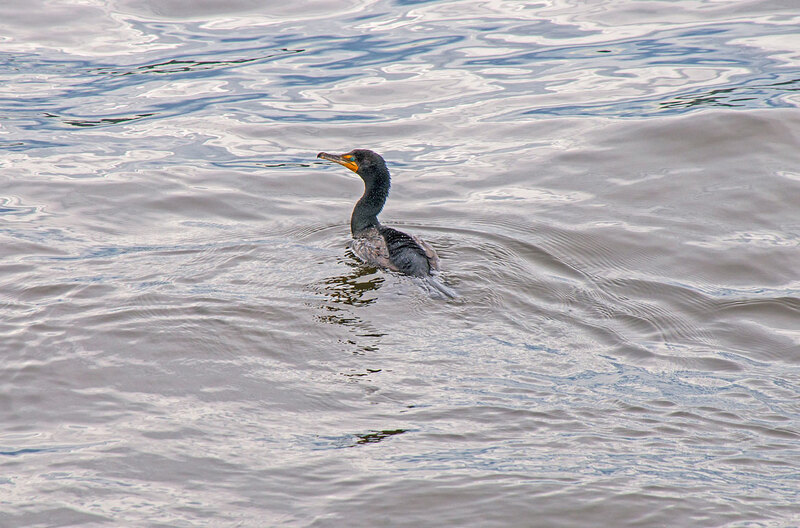 There have been a large number of Double-breasted Cormorants hanging around the harbor this year. There was some nice light and clouds behind the North Breakwater Light. We watched the Herbert C. Jackson approach the ship canal. Throughout the evening there were some interesting lake/sky photos. On a recent visit to Duluth I managed to capture a few photos of the North and South Breakwater Light. There was only on other photographer around and he was really wrapped up in his work. 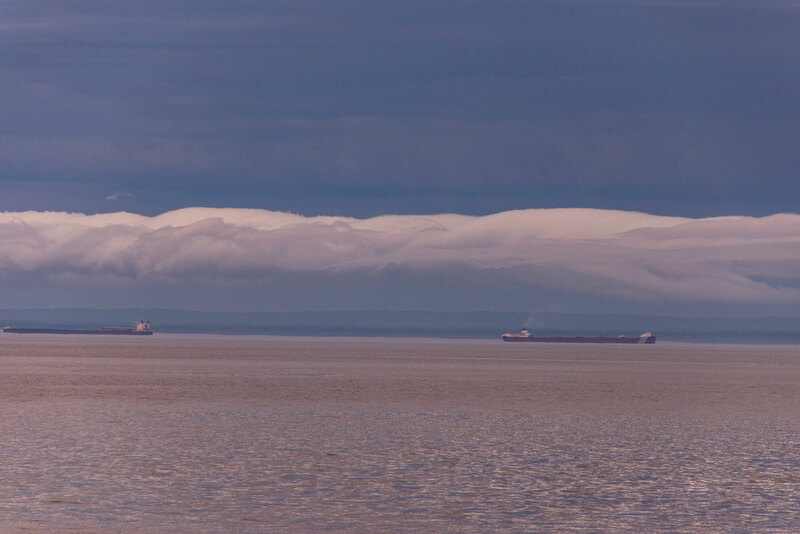 I was out on the South Breakwater Light to greet the Federal Rhine as it sailed in to Duluth, Minnesota. The ship was not carrying any cargo as rode so high in the water that the propeller was almost out of the water. 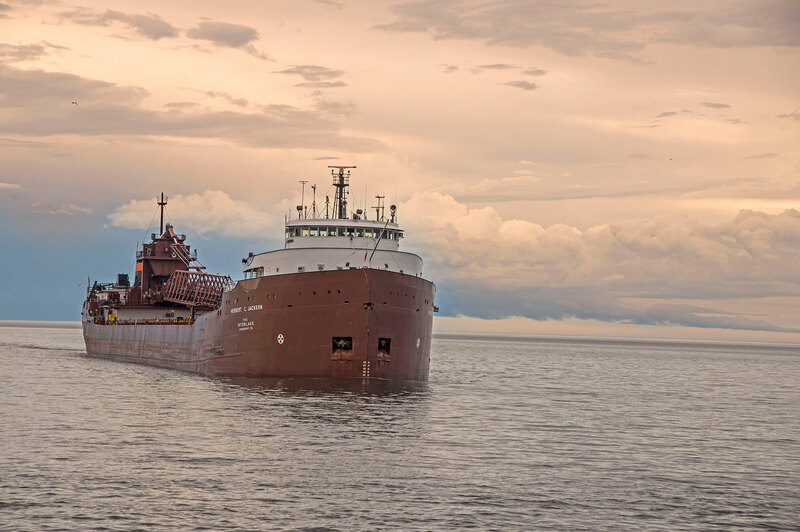 As it sailed into the harbor it was met by two Great Lakes Tug boats that assisted it into the docks. Large forest fires in Canada resulted in a beautiful sunrise in Canal Park as the smoke covered the horizon. My wife and I walked down to Canal Park to photograph the arrival of the Vikingbank. This would be the first time I photographed this particular ship. I misjudged the speed of the ship and it seemed like it took forever for it to arrive. In the mean time my wife and I went for hot coco, sat around, walked around and finally decided to go back to our condo. It was then that we could see the ship emerging from the fog on the lake so I decided to walk back to the Ship Canal to take some photos. I have never seen so many gulls on the breakwater as there were this day. Of course, just after took the above shot the Vikingbank sounded it’s horn and all of the gulls took off. I turned around just in time to snap this shot. In November the gates are closed to the North and South Breakwaters at the Duluth Harbor entrance. This was one of the last chances I had to photograph from the South Breakwater Light before it was closed for the winter. Sometimes the best time to photograph the sunrise is the hour before sunrise. This is referred to as the blue hour by photographers. It can provide an opportunity for some spectacular photographs. These photos were taken on dawn walk along the Duluth, Minnesota waterfront. 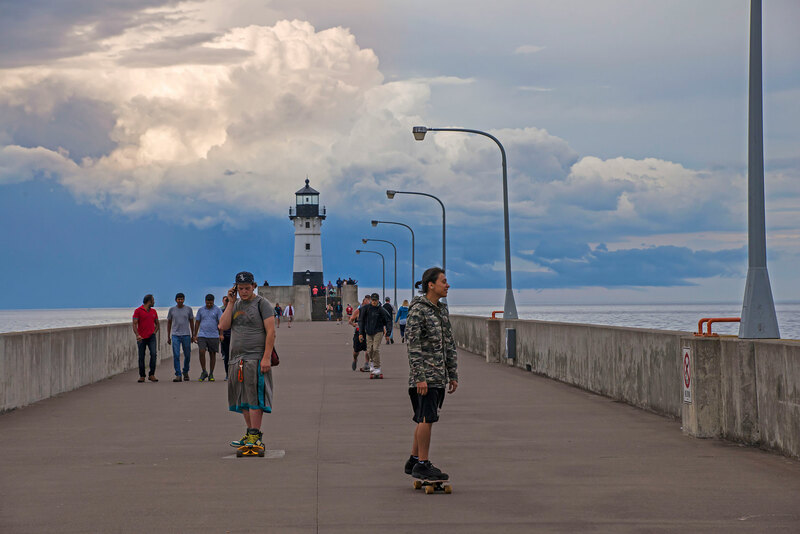 More photographs from the Duluth Waterfront can be found on my website. I managed to get down to the Duluth Lakewalk in Canal Park at dawn for a few photos. Fortunately this time of year dawn is not 3am. I happened to be down at Canal Park in Duluth, Minnesota photographing the sunrise when I noticed the Philip R. Clark out in the lake. 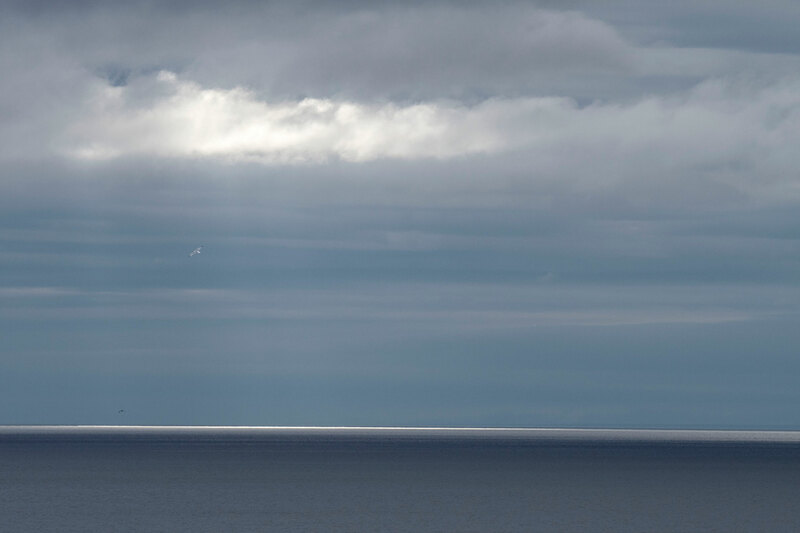 When I first saw it the ship was just a dot on the horizon. This shot was taken from the Aerial Lift Bridge. I walked out to the South Breakwater Light to photograph the ship as it neared the harbor and passed the Lighthouse and under the Lift Bridge.